It is after all, a conversation firstly between David and the reader. “It’s just you and me.” Let’s respect that personal time between him and individual fans. In the meantime, let’s talk about anything else. Like this guy here. I know. He's not there yet but it's just a matter of time. You know it and I know it. This entry was posted on Monday, May 24, 2010 at 1:40 AM	and is filed under Uncategorized. Tagged: Give me Chords of Strength, Practicing literary abstinence. You can follow any responses to this entry through the RSS 2.0 feed. You can leave a response, or trackback from your own site. Angelica – did you get my last e-mail? Still trying to get that article finished. Had my oldest son’s birthday party yesterday, I can’t believe he is 11. Went shopping afterwards with his bday money and had to listen to my almost 6 year old make an excellent case for why he is in fact old enough, smart enough, and responsible enough to have an ipod, cell phone, and laptop. Not gonna happen. This little guy is an older soul like you-know-who. He even told me how frustrating it is ‘being trapped in this 5 year old body’ and asks me weekly to sign him up for various artistic endeavors such as piano, guitar, and singing lessons. He’s angling for a keyboard, I told him maybe after he actually writes some songs by telling me and I’ll write the words down for him. He told me that he needs the keyboard in order to write the songs, so he can ‘get the melody to come with the words’ Meanwhile my 11 year old tells him to please just be quiet and stop acting like a hippie. LOL! My book is coming TODAY. OHMYSTARS! Good plan! I won’t have my books until after June 1st. Thanks for all you do. I am loving the girl with the ocean blue eyes. No spoilers from me! But if anyone thinks he/she cannot possibly love and respect David more than he already does, he is “wrong, wrong, wrong” as my little niece says. Here is a nice way to spend five minutes of this interminable wait for new music. This is Jennifer Hudson singing “Believe” on the Brooks and Dunn tribute last night. Why, oh why can’t we hear David doing an inspirational duet with someone who can blow like Jennifer? Video courtesy of MJ. I’ve also been listening to The Prayer (Bocelli and Celine Dion) and Vivere (Bocelli and Laura Pausini). It helps the wait a little…. “Trapped in a 5 year old body.” LOL! Yeah, I know the feeling, in reverse. He sounds like an awesome kid. Maybe you need to get him the keyboard. You could have another David in the making there! You haven’t given up on that article yet? I thought it would have beat you down by now. Just keep your head down and keep watching your back. 8) If you can combine the two. 😆 Sounds like you need to ease down a little hippie. Excited much about the book arrival? Don’t make your 11 year old have to get after you again. haha. You mean he is actually gonna make us love him more? I hadn’t thought of that. Gaaaaaahh!! I will patiently (okay not patiently) wait for June 1st – somehow! In the meantime I have a signed copy on order from Bookends and another copy from B & N’s that will be at zoe’s house awaiting my arrival for our road trip on June 1st. Since the ones zoe ordered will be arriving any day now, I am wondering what the hubby would say if I told him “I’ll be right back – have to stop by zoe’s house to pick something up that she has for me” – after all she is only an hour and a half away:)! Thanks Angelica, appreciated the vow of silence. My orders from Bookends and Amazon will be among the late arriving. Archiesfan4life – if you go pick up that book, might as well get a motel room for the night cause you’ll never make it back home! FG – your kids sound great! Thanks for the story, it started my day with a grin! My book is arriving tomorrow! FG…I say get him the keyboard, he’s made his case in my eyes..lol Very curious about your article…. Xaris, love him more?! I better get a grip! Archiesfan4life… I’d go get the book…maybe you and Zoe can meet half way for dinner or lunch or something. Emmegirl…I broke down and ordered from Barnes and Noble, Amazon’s order won’t be here until the 4th. Was able to refrain from ordering one from Bookends because dang it he has to have a book signing on the west coast…hoping and praying. David wishing AOL a happy anniversary! I have a friend receiving shipment of both our books who lives an hour and a half away too. We are doing like Djafan said, and meeting half-way for lunch. Lots to discuss! Thanks Angelica. I was going to order the early arrival B&N, but changed my mind. I’ll wait. Self control is a good thing. Self control is a good thing……. Angelica, thanks for the “gag order” on sharing any of David’s pearls of wisdom from COS prior to June 1. I would advise people to shy away from Twitter, It’s a mine field over there, dang it. I haven’t seen or heard this much buzz about a book since “Return to Peyton Place”. Bliss #12 I haven’t seen anything yet, even on twitter, so I guess it just depends on who you follow! My book will be here tomorrow, and thank goodness I don’t work tomorrow or Wednesday, so plenty of time to read it. Who am I kidding, will spend all day reading it and night and then sleep on Wednesday!! Boy, we really are in a drought aren’t we? 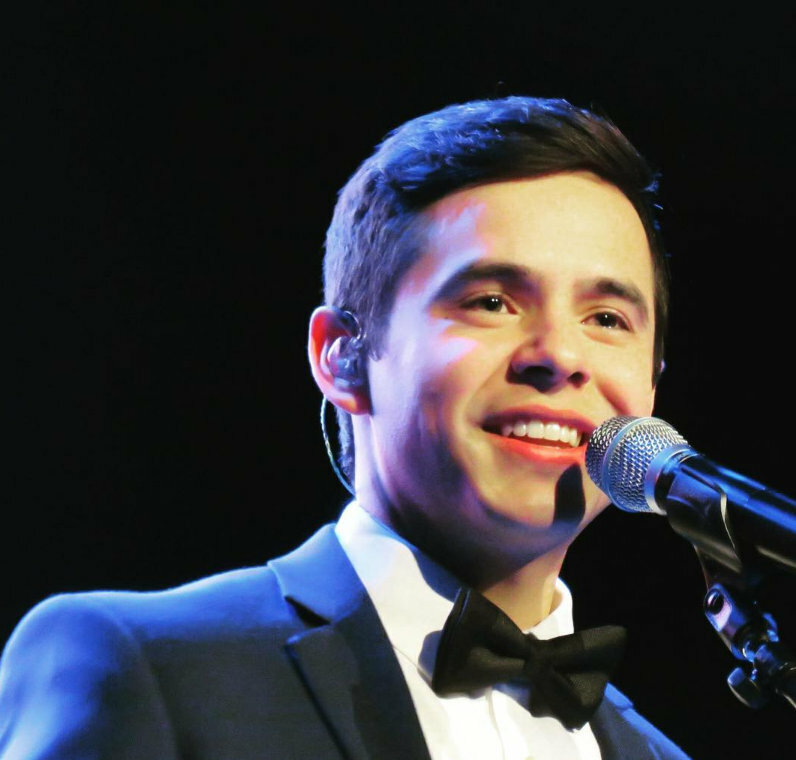 Getting tickets to David’s BYU/Idaho concert on June 19th was a crazy adventure. Good tickets went fast, like before you could even get on the site. And apparently nearly impossible to get through on the phone. Did get seats though, can’t complain! Going to be a fast road trip though, leave that morning from home, drive 4 hours, dinner, concert, drive back home right after cause it is Dad’s day the next day!! I am too old for this, but anything to hear him sing again! Well, Happy Reading to all. Am excited for chat on Thursday night. Will spread the word. I taught a friend who visits the site all the time (but never done chat before) how to do it chat last night. No one else was chatting, so I just showed her how simple it was, and since we were on the phone, we didn’t chat there. She is so excited. She loved the vids there. Have to say it again, love it here because of all of you. 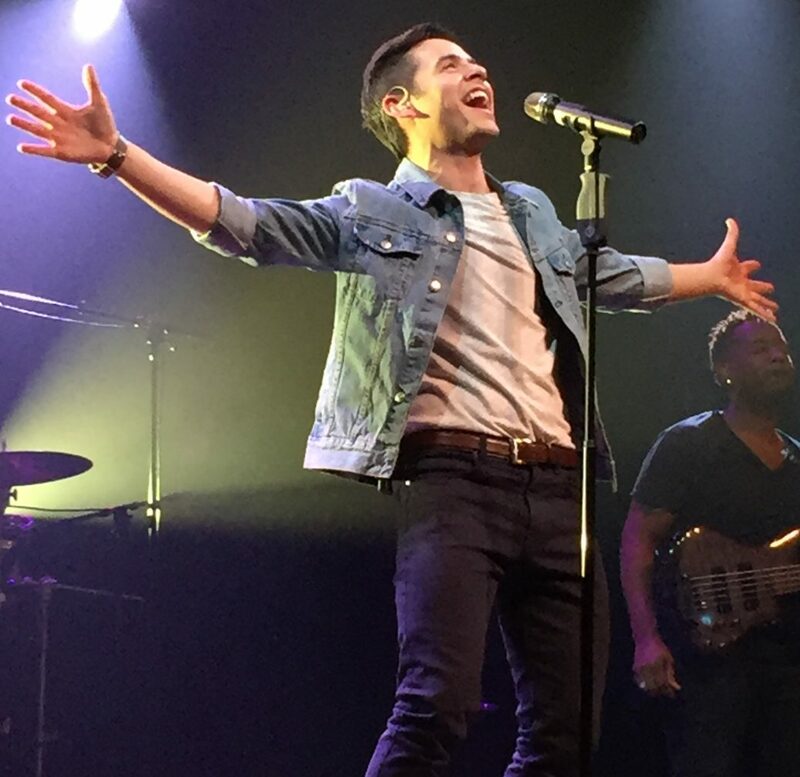 This is the best place to be for all David Archuleta info and love. There is no way that I would cancel my order, are they for real??!!! I was right here at 12:45 PM and nobody tried to deliver anything. I called my local post office and it seems they made an error. Ya think? LOL They assured me that my book will be delivered in my regular mail delivery today. As I said, fingers and toes crossed!!! I’m holding it in my hands! This is my first time commenting here at The Voice. #13 Shawna told me about it (have followed many of the others David sites since Idol) but am new to this one. Can I tell you right now that I love it! I come here first every day. I am almost shaking with excitement today and have already determined that I will probably get nothing else done today. First, getting tickets for the concert at BYU/Idaho was a major endeavor, and I ended up with four extra tickets (if someone wants them, email me at pattiadams@aol.com)Then waiting for the book to arrive today is so huge. I am a bundle of nerves on over-drive with uber excitement. Can hardly wait for the chat on Thursday. Thanks everyone, I love you already. Welcome to The Voice! Lucky you going to the concert. I’m counting the minutes for my book arrival very little else is being accomplished! And by all means join in the David love! Wow! You guys are making me salivate for that book. I’ll probably want to/need to join in the book discussions after June 1st, if that’s ok. I’m trying to avoid anymore spoilers. I want to feel as if it is as David says- “between you and me”. Welcome, Pattirae!!! You are going to never want to leave here ever, and wait until Thursday, and you will be addicted for sure. So much excitement is kind of tuff on us old chicks, isnt’ it? We tend to lose sleep very easy and this is making sleep that much harder to come by, but thank goodness for being old, cause we have more time to spend keeping up with all that is David, cause we have no little ones being left unattended while we do. So there are advantages to the aging process. You are all going to love Pattirae here. She is a wonderful lady and you couldn’t find a more beautiful person inside and out than her. I just luv her a bunches and you will too. Oh and…. Happy reading Bebereader! Thank you everyone for being so kind to this “newbie”. Gosh, Shawna, make me blush. This is gonna be fun!! Sorry, Pattirae, but it’s the truth! I told you this place is the bestest of all and you think this is fun now,it has just begun my dear! MY BOOK IS IN CALIFORNIA 30 MINUTES FROM ME…WOULD IT BE POSSIBLE TO GET TODAY? OH PLEASE YES!!!!! Well we got snow this morning. Would have been a good day to read COS if I had had one! June 1st for me reading COS and hopefully no snow! Happy reading, Bebe, and to all you luckies who have received your long awaited copies!! Hey Archiesfan4life, I think Djafan’s idea of meeting halfway can be arranged! My books should arrive any day now. To heck with my day job…as soon as they’re delivered, I’m calling in sick, filling up the gas tank and taking off, headed due west. See ya somewhere along the way! There will be no living with me once I have my hands on the goods. I’m going to retreat to my secret place until further notice. Told hubby to make sure to feed the kids while I’m out of commission. Oh shoot, My book didn’t arrive and it is only in Denver. Trying very hard to be patient here. that is so nice of you to post this. im sure considering we are all archie fans that we will respect that request. although i didnt get mine yet i am really excited for the ones that did. have fun reading and hopefully i will get my soon. good reading! Didn’t get my book either….tomorrow. @JosephKapsch Thanks! Will you post it on zap2it? @pabuckie you got it. I’ll tweet it out when ready. We got you covered and btw Archie’s real good peeps-great kid. LOVE Kimberly, Lakisha 2. #?!! Mine left Indiana about 9pm – wha-a-t? Why is it taking the scenic route? Leave for So. Cal tomorrow & not returning til June 1st. So I guess it sits on the porch til then. Not meant to be. My book is in Kentucky. WT?? We ordered the express shipping, so it left by pony express on Thursday of last week and is scheduled to arrive sometime this Wednesday. Muaahaha! Hi Pattirae and welcome to The Voice! Wow. It must be heaven to be looking forward to a David concert again soon. Have a great time for the rest of us K? 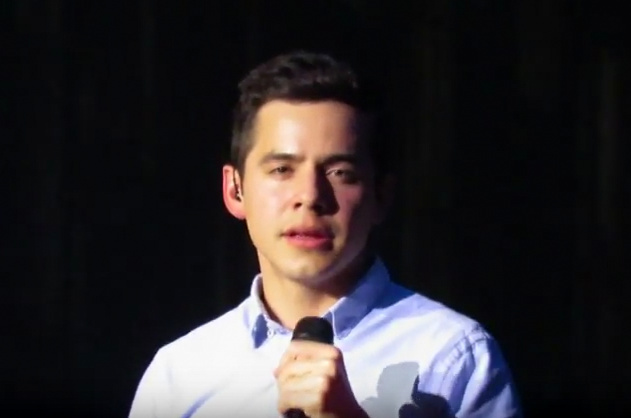 For all who are still waiting for COS and that next enchanting concert experience, I offer my review of his first performance of Desperate, Rockford, Illinois after hearing him on a live cellcast, then watching the YouTube vid the next morning. This is almost an out of body experience for me. Ah, David. Come back to us….Come back to us. by one and treasure them up in my heart. Last night he gave us, “emeralds from mountains thrust toward the sky,” and with Desperate, a flawless diamond. Umm Hi. I came up for some air. I devoured the first four chapters and am going back for more now. Mum’s the word but can I emote a little? Can you imagine what’s in store for us? At this point I cant’ even imagine I just know he is going to blow us away time and time again. hi pattierae! It’s so good to see you here. I met you at momjulee’s and can’t wait to see you again in Rexburg. Shawna, I ended up getting my tickets over the phone this morning–I kept doing redial, and it kept ringing busy so at one point I just let it keep ringing busy without hanging up and all of a sudden it connected thru. Then I had to go thru registration with the nice lady–I’d already done that on-line, but gave up as I could see them going quickly. She kept talking to someone in the background while I’m muttering to myself that we need to get this moving as the tickets are getting gone. Anyway, I was able to get them and all was well–except my sense of balance since I felt like I was teetering on a cliff for the time it took to get them. Can’t wait to get there. I hope I get my book–my mail-lady hates her job I think. I was expecting a certified pkg from our attorney for 2 weeks and finally found it sitting at the post office with 2 notices for pick-up, neither of which were ever in my mail box. Thanks Angelica for the gag order–I appreciate (really I do) the order–it’s only fair. Love the shadow on the wall. Angelica, I am entranced with that shadow. Nice shadow…I’m strapped in too. 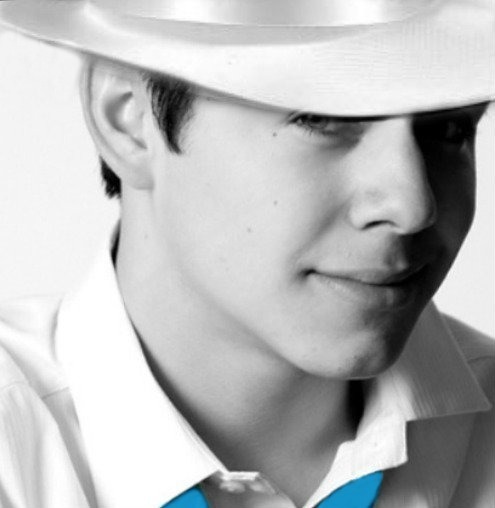 Wow, twitter went abuzz tonight after the twitvids of David came across. And it was slow here too, until all of a sudden my phone started buzzing like crazy to let me see all the comments here. I really like the hair myself, I have to say. Can’t wait to see him in two weeks! Bebe, glad to see you resurfaced for some air for a minute!! Hope you are emjoying the book. My turn tomorrow, yeah!!!!!!!!! I think you should pace yourself. That’s what I’m going to do. Hold it and touch it and carefully peruse all the pictures, the contents, the cover art. Inhale that “new book” smell. Savor it the way I do a fine creme brulee. Crack the surface by opening the book. Start off slowly enjoying each delicious tiny spoonful one word at a time. Then lose all control and gobble it all down! haha. No one performs this better – NO ONE. Not vocally or expressively. oops! guess I posted that link wrong. Can one of the admins please fix it? For me it was reminiscent of DLG Sayerville, in that you could feel ALL of the emotion of the song. Of course, this is from my vantage point (youTube video) not live. I may be missing something. Loved the colors and strokes of paint you used to create a wonderfully moving picture. One of many treasures on this site. To post a youtube in comments, look under the video, lower right corner, for the word Embed. Left click the word Embed, then right click and copy the link that appears in the url field box to the left. Paste it into your comment. It will be a HUGE long url. When you click submit after you finish your text, the video will embed. WOW! There was some exciting news overnight eh? I got excited for a second when Rushfield said there was a NEW song. 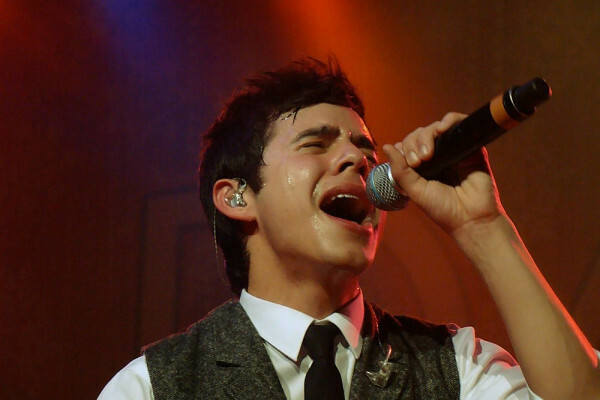 I looked at the twitvid and its a song David sang on his solo tour in the medley. I wonder how big a fan Mr. Rushfield really is, or is he pandering to fans to get readers? (cynical soul that I am). I missed being around yesterday. I had a much dreaded visit to the dentist (dental phobic extraordinaire) for a broken filling. Nice to find out there are improved methods for “sedation”. I survived! Earlier in the day I listened to David’s Women’s Conference talk. I needed that pep talk to put things in perspective. David the teacher! 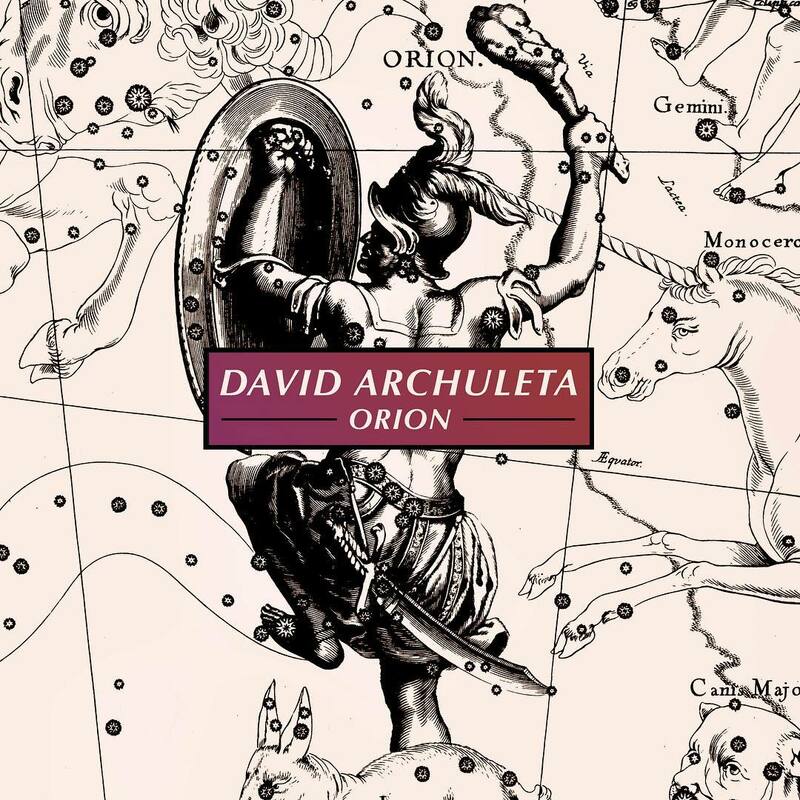 Abrra – in the video of CRUSH it sounds like David did sing a “new” song and maybe he asked for no one to film it? IDK. Hey soul sister, ain’t that Mr. Mister on the radio, stereo, the way you move ain’t fair, you know! Thanks for that. David is such a tease. I guess he told them to stop recording when he did a test flight on the new song. What I love is it seems like David has a lot of respect from everyone in the music industry to NOT LEAK any songs!! I’m liking that! Last Day to Vote — Best American Idol EVER! David sounds better than he ever has. I love his cover of Hey Soul Sister. I like the way he said at the end “Thank you very much” and his new “doo” — reminded me of ELVIS! Ha ELVIS was in the building! and did u see Kristy-Lee and Brooke in the video? sorry meant brooke and kristy were in the gotta be video. Brooke, Kristy & Scott from the party last night. CAN YOU BELIEVE HIM?????!!!!! !SOUL SISTER??????!!!!!!! He’s making me yell so darn early! He tried a new song on them….we know Rushfield loved by his tweet. He’s a superstar. 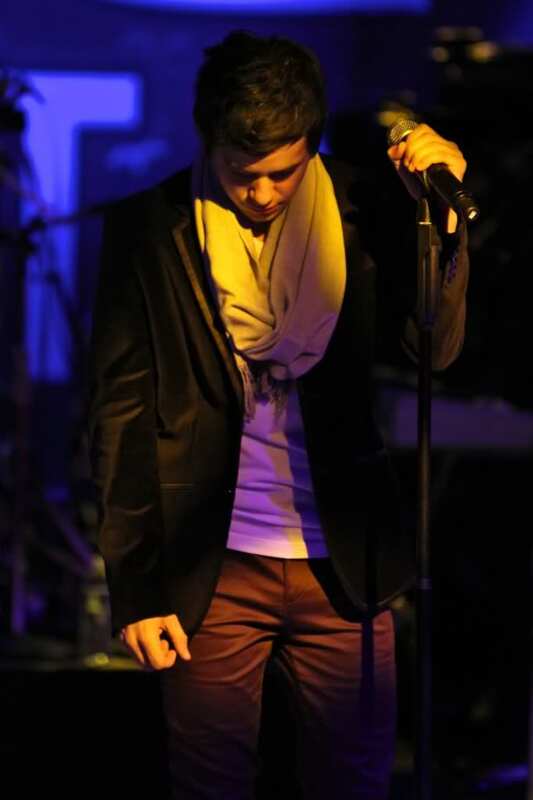 :)All of the other idols; everyone in that room, knew the words to his song. They were reaching out to him exactly like his regular fans do. Dying here!! I am so happy for him I could burst. I plan on spazzing all day today, and tomorrow as well. David WON THE POLL by 92% !!!! “Now that you’ve crowned David the best “Idol” of all time, we know your eyes will be on the Season Nine finale this week” — hmmmm does that mean a song? 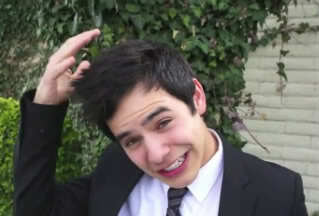 David is the greatest idol!!!! 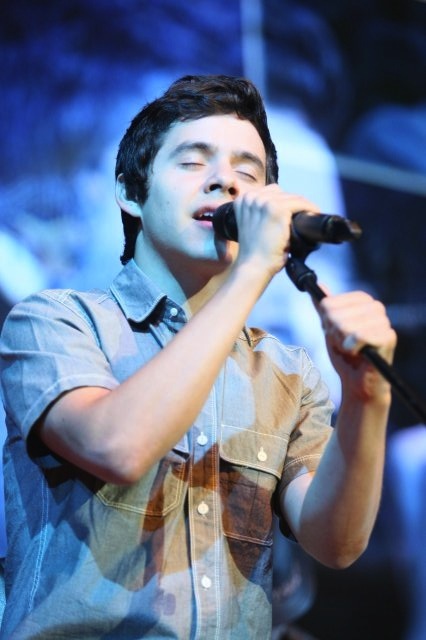 David’s Soul Sister falsetto’s are killing me….. I REALLY love how he starts that song. He doesn’t hesitate, just starts wailing Heeyyyyy immediately! Someone help me out here. Sounds like he changes the words in italics in the second stanza but I can’t make it out. I don’t think the hair is quite where it’s going to be yet but I so love that it’s off his forhead again. 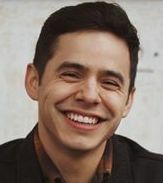 Congratulations to David for winning the best American Idol ever!! 92% of the vote! That is so cool! And they sure were fanning over him last night. Very proud of our guy today. Hmmmm-Here’s the link for the new song David performed last night. It is posted on a radio website so I assume it is with his approval. I’m with you, Angelica. I’m liking the hair more and more now that it is off his forehead. That multi-directional plaid is giving me vertigo, however. Can we take up a donation and send Silverfox shopping for him? Xaris…’take up a donation and send Silverfox shoppong for him’…that is a wonderful idea, but I do like the boots! I like the new song…wish I could hear it better. It’s very soulful and current. Sounds like David hopes it makes the album. Boy, he is rockin’ and dancin’ in that vid! Angelica! cracks me up — glad it’s off his forehead! HA! Feast or famine, I tell you! I’m loving the new song David tried out last night “If I Could Only Be”. Have it on repeat. I hope it makes the cut! Oh,my, oh my, oh my, Igo to sleep last night, get up and my phone is full of tweets and comments during the night. I guess no one could sleep with anticipation of a vid of the new song!!! I see Cb was up most of the night tweeting with Annie from Germany. Then I leave for 2 appointments this morning, come back and surprise, surprise, a new song vid! I am luv, luv, luving it!! I think I have listened to it 20 times since I got home. Can this day get any better? Oh wait, yes it can! And the pictures taken last night. The buzz on Twitter was not good sometimes last night about his hair, but how could you judge from those twitpics. Shame on them!! I love his hair too. He looks so grown up and he is aging well. One of the tweets wondered if he is going for the Benton Paul look. I wonder!!!!!!!!!!! Can’t wait to see him in person at the booksignings!! Did he look like he was having a blast last night or what? I am so happy for him right now. I am going out now to plant flowers since it is finally sunny here in Utah and 70 degrees, but I am keeping an eye out for that UPS guy to get here with my book. Better be soon, and with me being outside planting when he comes, he might want to be careful. I may knock him over with excitement getting my book from him. Hope I am done planting when it gets here, cause otherwise the poor flowers will have to take their turn after I read the book. Priorities here!!!!!!!!!! Have to say loved all the vids of last night songs. This is a beautiful day! Go to http://www.paypal.com, click “Send Money”, make your payment to: DAbumperstickers@gmail.com Price is $6.00 (in U.S. dollars) for 1 bumper sticker, $10.00 (in U.S. dollars) for 2 bumper stickers, (Add $5.00 in U.S. dollars for each add’l sticker). Click Purchase of Goods, then Continue to next page with payment info. Be sure to include your full name & mailing address (including country) to receive your bumper sticker(s). You will receive a confirmation email after your payment has posted. You can also receive your bumper sticker through Project Bearing Kindness, see the RSO website at http://www.risingstaroutreach.org for further info. on both campaigns. For any further questions, please email us at: DAbumperstickers@gmail.com. Great new song. Even with the “issued” audio, David sounded great and the song is an instant classic. If this song doesn’t make it on the CD, I can only imagine how great the ones that do make it are. The mall itself is beautiful, with plenty of indoor restaurants , shops, and walking areas. The store, where the line will form, has great air conditioning and a very nice coffee house, too. The staff I spoke to probably can’t wait to get back to normal. 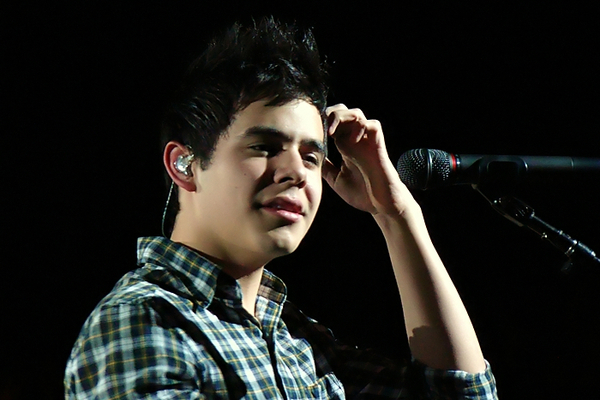 Every time I mentioned to someone that I had a question about David, I got that “Oh no, not another one” look (LOL). One particularly snooty gal made the mistake of asking me, with an attitude, “Isn’t he that cute kid from American Idol”? By the time I was through with her, she had her bags packed for Rexburg, Idaho. One particularly snooty gal made the mistake of asking me, with an attitude, “Isn’t he that cute kid from American Idol”? By the time I was through with her, she had her bags packed for Rexburg, Idaho. Well, I already set out the basket to catch the tomatoes—so here goes. IMO, I am NOT liking the hair. David is such a unique artist and person , I hate to see him succumb to looking like he fell into a cookie cutter type hairdid. I guess I don’t like the idea of him looking like every wanna be teen star out there, cause that’s not who he is. Maybe I’m too old to appreciate the “now” in look, but to me it looks shaggy and uncomfortable, and it doesn’t “fit” him. He has had several other different “dids” that make him look more polished and mature. I’m having spaghetti for supper tonight–thanks for the sauce. Maybe I’m just crabby cause my book isn’t here yet! PS– Doesn’t change the way I feel–I still love David to pieces. Although I have to say this. I AM IN LOVE WITH HIS HAIR. Whew. Got that out. Carry on. Doesn’t it feel like the day just brightened? Spotted this tweet on IDF. Possible National Anthem performance? 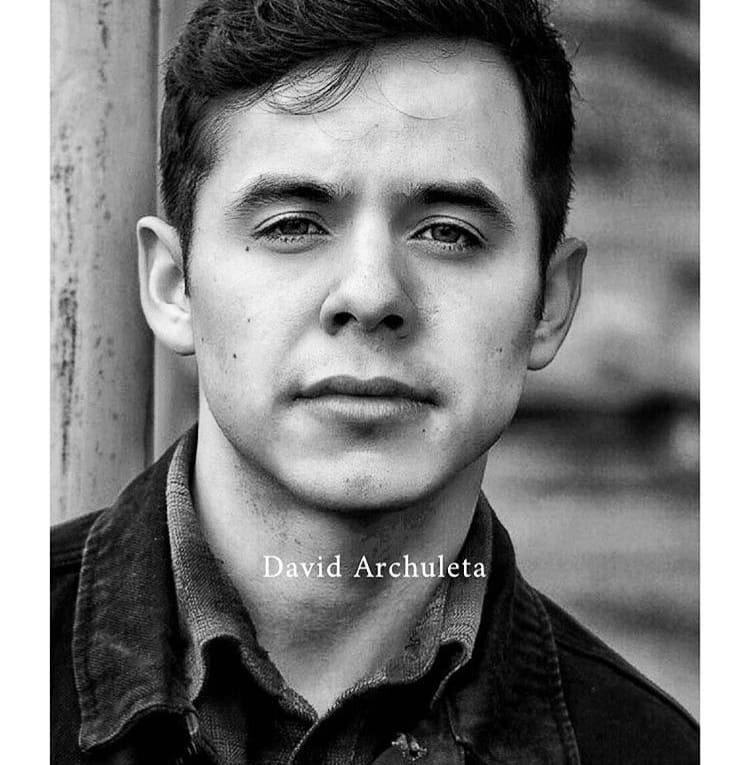 @hot995 David Archuleta is coming to DC for the Nats game on June 9th! Another video of CRUSH — it’s lighter! LOL and a different angle. David as he takes the stage last night. The lighting is pretty good. its short but sweet. I don’t want the book to end!!! Gheez!!! All these radio interviews and website have his name MISSPELLEED — It’s one “T” people!! It’s only been 2 years. MY BOOKS ARE HERE! MY BOOKS ARE HERE! MY BOOKS ARE HERE! Another radio interview outside the Nokia. He mentions adding dates to the book tour. I got my book. I got my book. I got my book!!!!!!!!!!!!!!!!!! and i didn’t even tackle him. I just had a big smile on my face when he drove up and unreal, I had just finished cleaning up from planting flowers and was turning the water on to water them. PattiRae was on the phone with me when he drove up and I just started squeeing so loud and she is going, what, what, and I am like it is here, it is here. She is like, what is here, and I am like, my book. Can you tell I am more than excited here? I am just rambling on and on. I am just sitting here admiring it. Bebe, I am scared to start reading it cause I won’t ever want it to end either. I am going to have to contain my speed reading skills and be patient and read slow to make it last longer. I just pray I can do that. The pictures that have been posted since I went outside are priceless. I love his hair, sorry to say. I really do, sorry dakgal, but it makes him look older. I am older too, but my 20 year old has the same hair and I like it. By the way, the UPS guy whose name is Monaco Trujillo, is David’s cousin, or should I say Jeff is his cousin, but they get together for family stuff all the time, like just had a cousin get his Eagle Scout award and everyone was there except David. He said lots of things, but I don’t remember it all cause I was too excited and it was such a coincidence when he asked my why I was so happy and I told him what was in the package and he said he is my cousin’s son. I am like, what a small world. Okay, I am done, Srry about the rambling!! Haha, Dja, we are both squeeing!!! So glad all the books arrived!! Go to it! I’m loving today’s radio interviews. I can hear a more mature David on the other end of the journalist’s questions. I’m proud of him. Is anyone else bothered at the fact that David’s name is misspelled on all of these websites?? Is it just me?? When his new CD comes out and it gets promoted….are these radio station websites still going to misspell it?? I hope not! 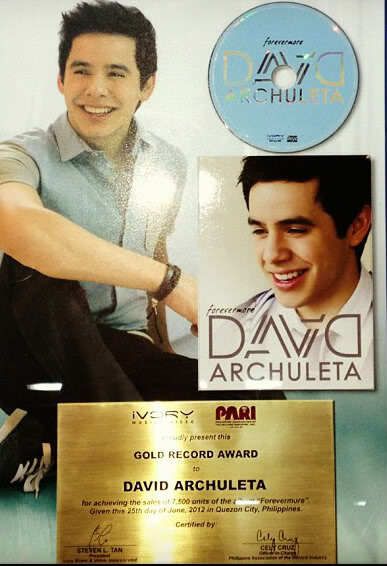 David works so hard and deserves to have his name spelled correctly especially with an upcoming new album. 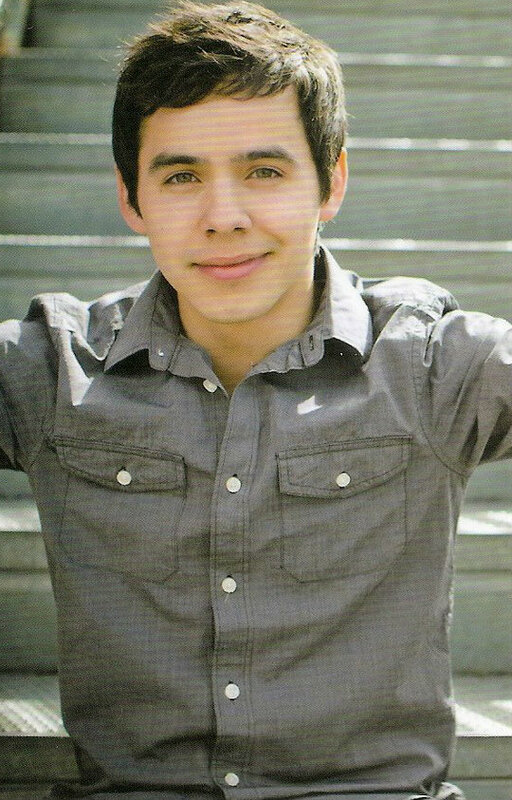 Archiesfan4life – where are you??? I have something you’ve been waiting for, haha!!! Now if I could only steal away from the family to start the first chapter. And what the heck… all my favorite shows are having grand finales tonight – GEEESH!! Guess I’ll have to get started when everyone’s gone to sleep! Sooooo psyched!!!!! I’m so jealous of all who got their books already. I should be getting mine tomorrow *fingers crossed* I can’t hardly contain my excitement. It’s a good thing we got all these video so I can keep myself entertained until the book is in my hands. Djafan and Shawna, enjoy your read! Bebe, Chapter 8! Well by the time you see this, you’ll probably be much farther…and you don’t want the book to end? Oh my, it must be wonderful. I’m squeeeeing for all of you. Well now, I just knew something was up but didn’t know exactly what. Boy, was I in for a surprise when I got home from work today!!! I just listened to all the videos from last night (wish the lighting was better!). 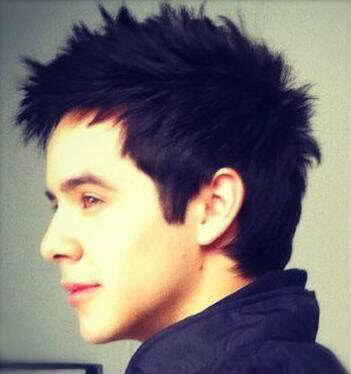 And for the record, I really, really like David’s hair. I do! David is only 19 and it’s a hip, young style. He can wear it spiked up and away from his forehead or with the bangs if he wants. He has a beautiful head of hair. I believe I would like his hair any way he chooses to wear it. David is beaming! He is so hyped up & just so happy! Glad he was able to be with his friends from AI last night and just be himself. Will he perform on the stage at the Finale. Doubtful, unless they want him to sing Imagine again! JK! 😆 (IMO, he should just record it. He “owns” it now anyway and I bet Yoko would be honored to have David record it if for no other reason but to honor John Lennon). Last years Red Carpet, while we wait for fresh video.Here David seems to still struggle with the “star” attention that he attracts. It will be interesting to compare what we see here to this years interviews. East Coast Livestream of Idol tonight NOW! #106 — Well I guess it doesn’t bother anyone else since no one answered my question. So be it. I just hope they get it right when his new CD comes out. Pabuckie…it does bug me, but I’m so overwhelmed with everything else he’s doing, the recognition he’s getting, the interviewers are now treating him with respect, like a serious singer/songwriter, like his opinions and thoughts matter…this is more that I expected. I been getting google alerts constantly quoting David. Just great stuff….So my hope is that the correct name spelling will catchup with everything else eventually. Sorry Dak. In the bottom pic of #113 that hair is evocative of some other worldly, middle earth being of incredible beauty. Kinda strange and wild. But sweet. Is the the target hairstyle? Bebe and I talked today and thought David was very Elvis like last night in those videos. Sighing all over the place. “IF THERE’S ONE PERSON WHO CAN RELATE TO THE FINAL AMERICAN IDOL CONTESTANTS, IT MAY BE THIS GUY. I watch AI, I wonder, where is the passion? where the soul of the program? I think that was with Paula. And I suppose that the brain will go with Simon. I felt empty watching the program, compare it with season 7 and the disappointment was so huge I am sad. 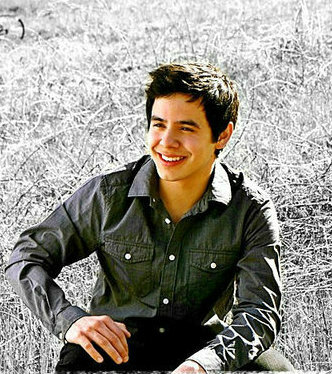 I think only new videos of david glad my life, the new song. But all new david are just drops of the great ocean, the beautiful ocean that we know is David. David, we are thirsty, we drink in large quantities. Hello everyone! I read the book yesterday. I am beyond amazed and have never been more proud, humbled, and honored to be his fan. That’s all I’m saying for now. #124 FG — ditto for me here!!!!!!!!!!!!! The book so far is amazing…2/3 way through. I’m also in awe and humbled and love him so much more if that were possible, I know Xaris warned us, but what an overwhelming feeling. Shawna, have you read the book already!!!! When you told me yesterday that you were a fast reader, I didn’t dream you’d read it in one evening. lol I’m expecting my book today and knowing how I read and reread the whole time, it will take me a little longer. It was fun to be on the phone with you when your book arrived, listening to you talk to the UPS guy about David and then hearing him talk about David being a relative of his, etc. 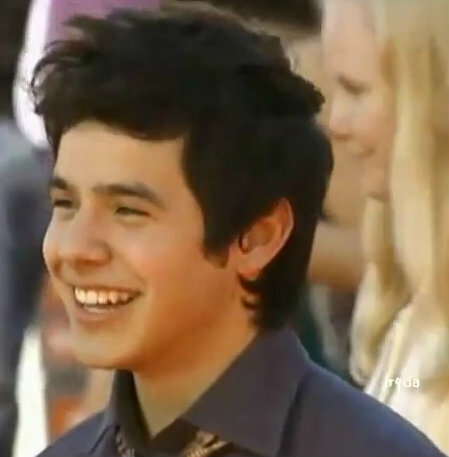 *smiles* I am soooo excited to see David on the red carpet tonight, I can hardly stand it. I am still in such a dither with all the things going on with David right now—The VIP appearance as “The Entertainment” for the evening, The VIP videos, The VIP music, The VIP new song “If I Could Only Be”, The Billboard win, The interviews, The new single announcement, The new CD announcement, The red carpet, The new look, The book signing and SINGING, The Rexburg concert, etc. I am having a difficult time concentrating on anything else. Is anyone else having this same problem? I really do have things I need to get done. Then my book will come and I am in a real fix!!!! I’m blown away! I finished the book just a few minutes ago and am filled with respect, admiration and pride! 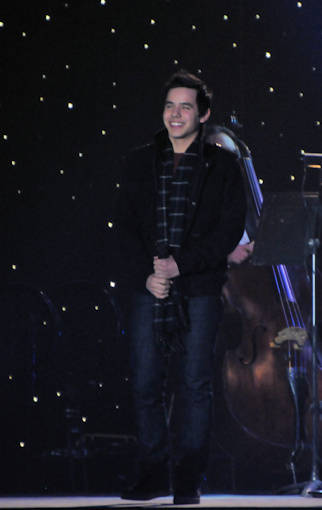 Mr. David Archuleta, YOU ARE ONE CLASS ACT! Whoo, my head is spinning reading your post and seeing it all there in one paragraph. When he finally decides to surface he sure does make a big splash! I need a towel! LOL! #127 Pattirae, I had it read before the sun rose this morning. Told you I wouldn’t be able to put it down once I picked it up and started to read it. Patience just is not my thing!!!! Didn’t even start it until midnight even, cause of real life, and I didn’t want any interruptions whatsoever. Now I am useless today, not only because of the late night, but because I am blown away by this incredible young man. Who would have thought that at my age that I would be taught by a 19 year old young man!! Just took a nap, and since the day is already half over, I may as well begin reading again and really take it in slowly this time and learn even more, if that is at all possilbe. He truly is a gift to us from God. 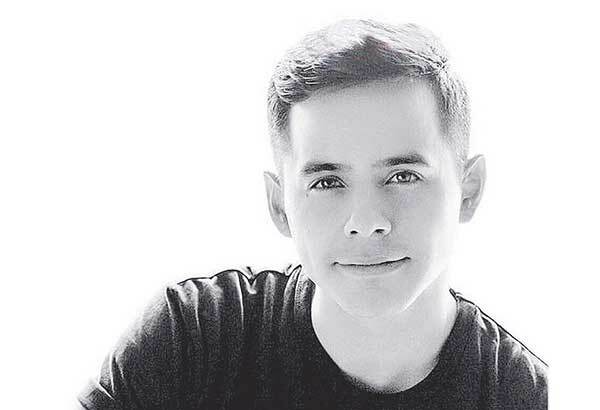 ‘American Idol’: David Archuleta picks Season 9 winner — Team Crystal or Team Lee? Finished reading David’s book last evening. I’m more impressed than ever with David. Enough said for now. Enjoying all the activities and excitement of the last few days, especially performing for the countdown event! Fantastic!!! P.s thanks for a wonderful site. This one is with 106.5 FM. I miss Paula! She talks about David at 2:31. Then David and Cook arrive at 3:44. Guess I’m a majority of one–can I still come home? Sorry to chime in so late. I too, will not be getting my book until after June 1st. It’s just as well since I can’t really get into reading it until school let outs. I’m excited to hear his “voice” recounting his personal journey up to this point in his life. I’m even more excited to discuss the book with all of you here. I belong to a book club and am thinking about submitting COS as an offering for next year’s book club list. I think that it’s great that so many who are older than David find inspiration and wisdom from reading his book. So often we discard what another person can say because of their age whether it’s young people who feel they cannot relate to an older person’s experiences or adults who feel a teenager or younger person has nothing of value to add to a discussion because the assumption is what would they know- they haven’t lived long enough. BTW I must confess I was a little disheartened to find out we’d have to wait a few more months longer to hear the new single. I was oh so looking forward to getting a new song for my summer soundtrack. I will be cleaning up a local beach and would’ve loved to blast David’s new tune under the hot sun. Yes, patience is a virtue I need to work on. Djafan, that video is so friggin’ cute. Txbilslp, He is so friggin cute! I bought a book for my 13yr grnddaughter, she was so excited to get it and started reading right away. I think you’re right this book should be made available at all school libraries. Our youth need someone like David to look up to. Great idea! I am going to purchase copies for the public library and the middle & HS’s in my small town. The Amazon price was about $12 the last time I checked. YO! Dakgal? How is this hair? 🙂 🙂 🙂 🙂 🙂 It could be worse , ya know? To me, the hair looks fine. It’s the questionable character hovering next to him…(ugh.). Now that works for me. Djafan, I like how you do things. Red Carpet Picture!!!! He’s Gorgeous!!!!! Been on the road for a couple of days, and come home to all of this, new hair, new songs, covers, interviews ….life is good! I just love watching his growth and evolution into what is readily apparent, an amazing man. 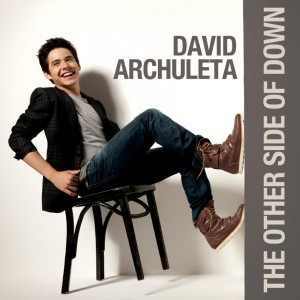 Covers, I love every thing he covers atleast as well if not better than original, Soul Sister, no different. He rocks! And I really like his new song, love the vibe, and yes the lyrics. Think this is indicative of more the style he wants to ultimately sing. 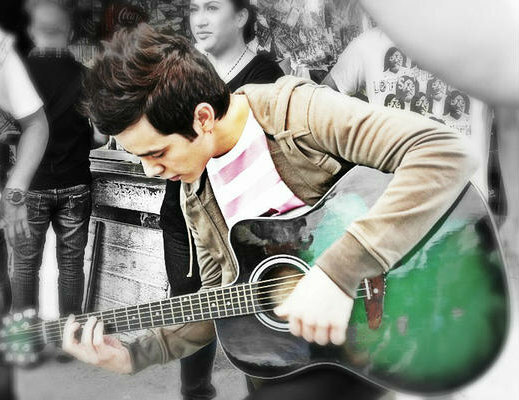 Think he will also always have those beautiful ballads that showcase that voice. And those dim lit disco videos with the grooving David, aaahhhhhhhhhh! Off to watch AI Finals, praying for an appearance! Well…….THAT was a quickie. 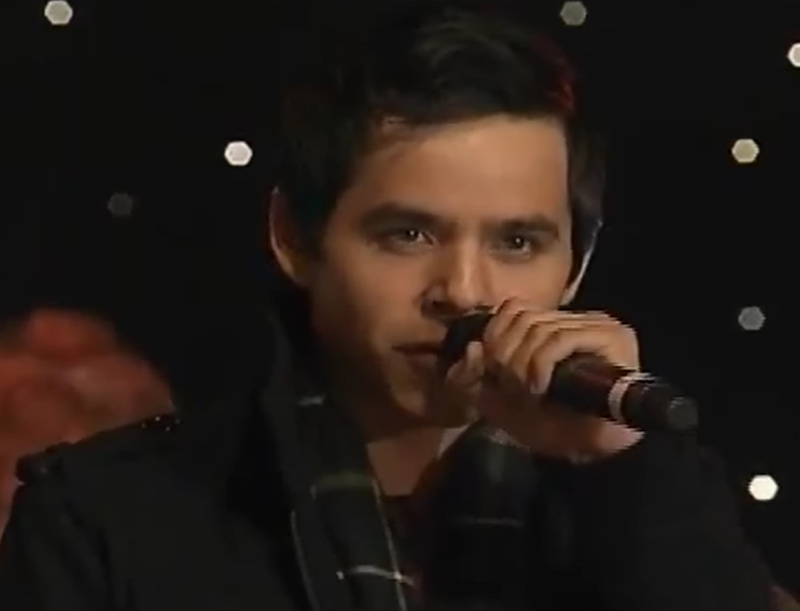 David was on camera for 5 seconds & may I just say, he looked fantastic in white head to toe! Where was Cook? Where was Lambert? And Clay? Bedtime for me. I’ll have to wait til tomorrow to find out who is the new AI…ho-hum. Good night & sweet dreams to whoever is here..
hmmmm A new American idol… (((SF))) ho-hum is right, but 5 seconds of David WFM. My COS arrived today…. off to read myself to sleep, or maybe it will be an all nighter?? I CAN NOT wait to read it! Well well David made an appearance! It doesn’t air in my neck of the woods for another 20 minutes. Dear SF and refnaf…I could see his smile and that was worth it…What an amazing concert with all of the well loved musicians that span the years. Alanis looked wonderful, Chicago was a big surprise and it was great to see Janet Jackson. My book was held up and it just missed FedEx, but it will be here in the morning…sort of a Santa thing for me! I finished the book! I will reread several times. For some reason, never have been a fan of no one ever in my life, like I’ve said before discouraged my kids from being fans, this young man has taken my breathe away again and again. djafan, still patiently waiting for mine. After your post, I am just waiting. Can I just say I love those vids of him, the songs, his voice, his outfit, the dancing, the charm… am a completely hopeless case.